Once upon a time in the furthest and darkest corner of a warehouse there was a chest. 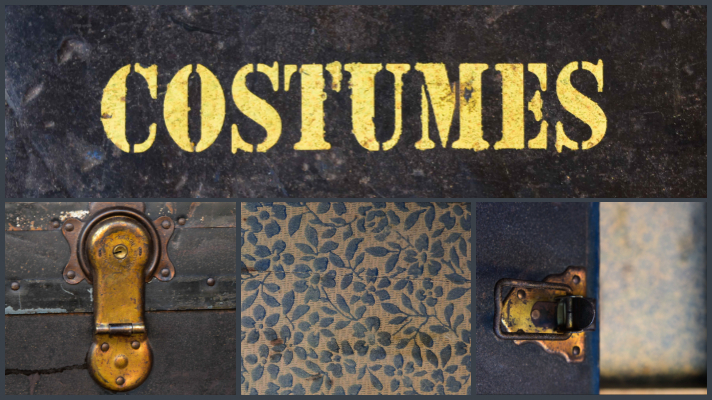 Once full of fine costumes, filled with glamour and soaking in the spotlight from behind the stage, now dusted and forgotten. Rather than storing pretty things – it was taking up space. 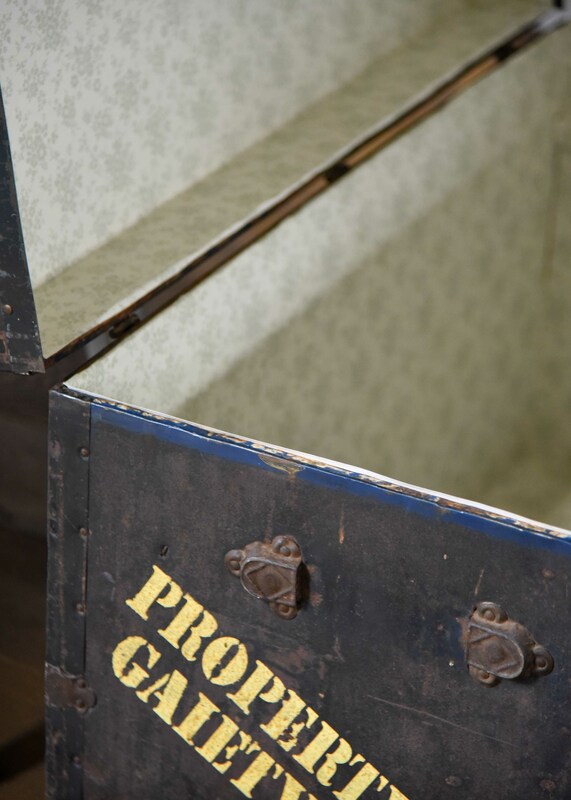 Rather than preserving keepsakes – it was kept just in case. Rather than being brought forward – it was pushed away. The trunk was made of solid hardwood. It had brass edge clamps and forged shamrock-shaped corner bumpers fastened with six stubs. On each side there was a thick leather handle for lifting, moving and shipping. It was strengthened with three vertical metal slats and labelled with a bright yellow army stamp font. A brass central lock and two side draw-bolts secured its content. Once blue, the top layer was now tarnished and its metal finishes corroded and distorted in places. Dust and dirt covered the lid and damp and mildew was damaging the bottom. One day it was found by a friend of mine. Was it the bright yellow imprint that caught his eye? Or was he lured by its mysterious content and curious to explore the inside? Anyway, he decided to find a new home for this bulky neglected trunk and knowing how much I love all things old he offered it to me. My eyes sparkled when I first saw it. It was a rare found. It was perfect. 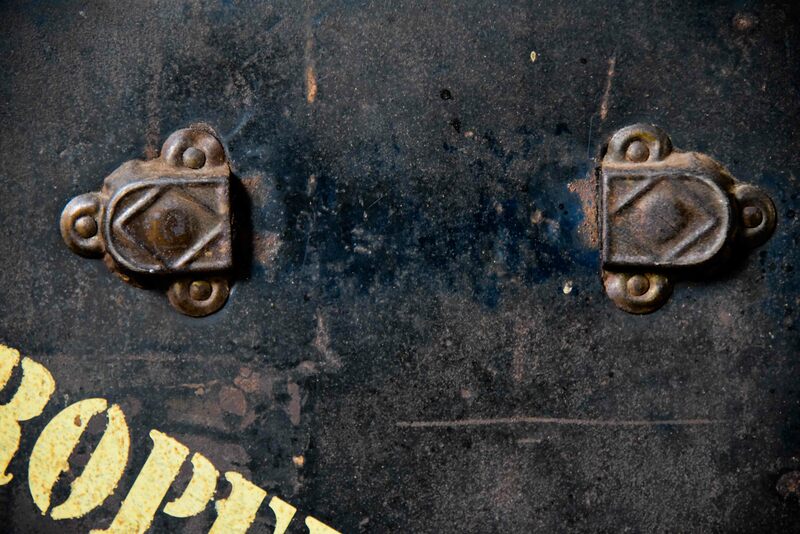 The trunk was still in a very good shape clearly showing good craftsmanship and quality of materials. Yet, there were a few bits and bobs that needed to be taken care of. I gave the trunk a careful wash and scrub with the good old bicarbonate soda. I fixed the hinges and secured any sharp or jugged metal edges. I polished the locks and drawbolts – not too much though, as I wanted to keep the aged look and feel. All that was quite easy and went smoothly. The biggest challenge was to get rid of the trunks content. As it did, in fact, store something for all these years. A strong musty smell that reminded me of granny’s wardrobe full of winter coats and of an unaired attic in an old house. The stench was overwhelming and had to go. I sprinkled the inside generously with, yes again, bicarbonate soda, closed the lid and let it do the magic. Two days later I thoroughly vacuumed the top, sides and bottom of the chest and the smell was almost gone. As ‘almost’ does make the difference I let it air in the garden for another two days and this time the smell was gone. Now all the trunk needed was a new wallpaper. There was no point trying to restore the old one that was stained, faded and torn in places. However, as I quite liked the floral pattern of the original lining I decided to match it as close as possible and picked a cream one with sage green flowers. I used a trowel to remove the old lining and evened the surface with sandpaper. I measured each of the trunk’s walls and cut the stripes of the wallpaper. Than I used a brush to apply a regular PVC glue and fixed my cut to measure pieces of the new lining. I finally smoothed it out with a pastry roller, tightly wrapped the paper around the edges and cut off any extra bits. 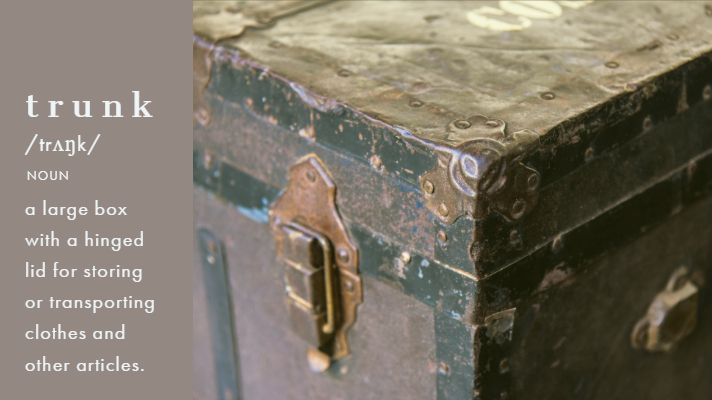 The trunk was now restored and ready to store. The trunk is about 90 x 58 x 53 cm and offers an ample storage especially for all things that cannot be folded, squeezed or bent. Sure, as Winnie the Pooh would say it is ” a useful trunk to keep things in” but it is also a stand alone piece that fits our living room just right. Apart from storage I use it as a coffee table, a prop and background for photos not to mention the good old hide-and-seek game. 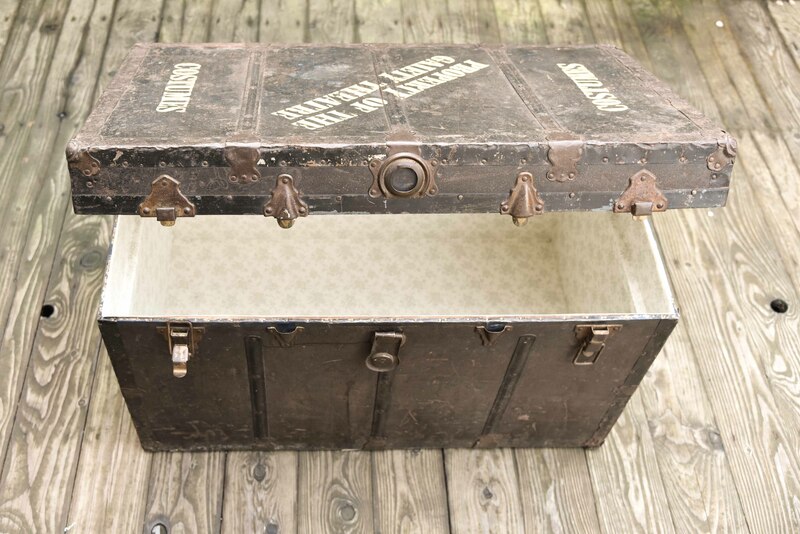 Can you think of a better place to hide than in an old trunk? It will instantly and magically transport you into your childhood adventures and the world of pirates, wizards and voyagers. I am so happy I have my own treasure chest now. I am as proud as could be for how it turned out. I am extremely grateful to Wiola and Tomek who gifted it to me. I know this trunk will have many more stories to tell. Every year I like to prepare a special treat for St Patrick’s Day so that apart from the must-have Shamrock Shake, Irish breakfast, Guinness stew and a proper pint at the pub there’s a home-made sweet to bite into to complete the celebrations. So far I have quite a nice selection of recipes such as rainbow muffins, Nigella’s grasshopper pie or Irish flag jelly. This year I am making shamrocks that seem as obvious as perfect choice as it doesn’t really get more Irish than the little three-leaf plant that Patrick used as a symbol to explain about the Holy Trinity. These little shamrocks are completely edible, naturally green and irresistibly crunchy. Unlike many other St Patrick’s Day treats they do not need any food colouring and simply combine 3 ingredients. I came across this recipe in an old Polish cookbook published back in 1978 when, I believe, no one heard of macaroons or celebrated St Patrick’s Day. At least not in Poland. 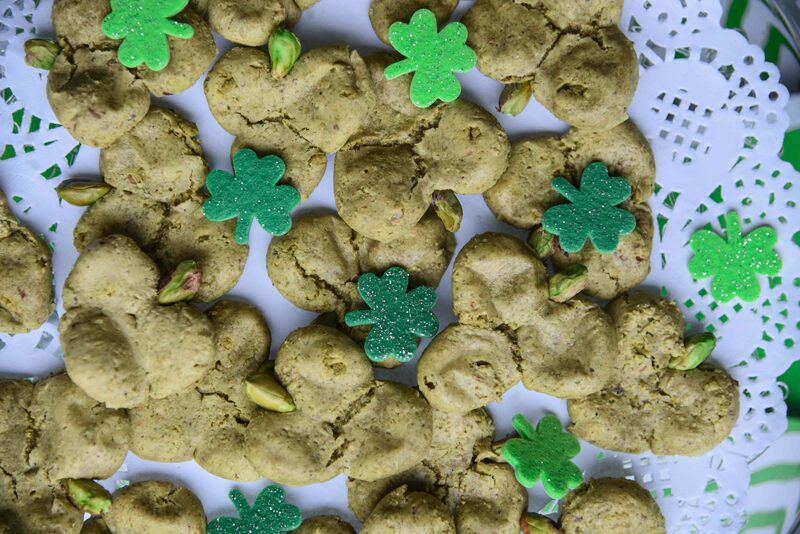 And yet, there is was – a recipe for shamrocks – and I knew instantly I will baking them this March. The original recipe called for walnuts but I decided to use pistachios instead as their natural green pigment adds just the right colour. ∗ I used shop-bought packages of pistachios in shells and needed about 550 g so that after removing shell and skin I got 240 g of pure nuts. First, remove the shells and skins of the pistachios. 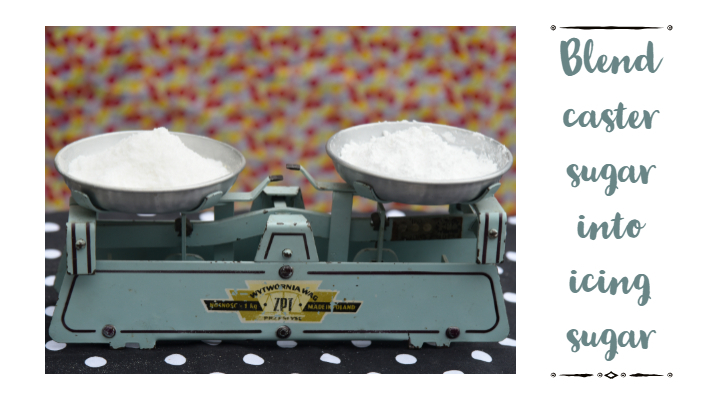 Measure 240 g and blend them into a soft powder. Keep the rest of the nuts for using as stems of your shamrocks. Beat the eggs until peaks start to appear then gradually add sugar. 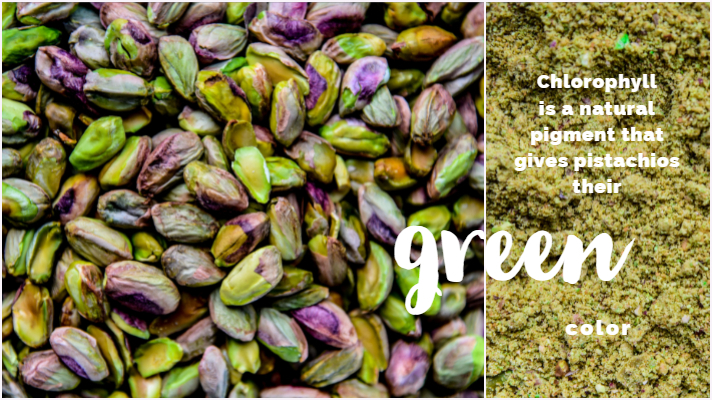 Gently stir in ground pistachios. Leave the mixture to settle for a while. Preheat the oven to 100°C and line baking tray with baking paper. Roll the mixture into 3 little balls or beans that are more or less the size of a Malteser, place them on the baking tray and press with your fingers to shape them into little leaves of shamrock. Stick a whole pistachio nut as a stem. The mixture will make about 30 shamrocks. Bake in the oven for 20 minutes so that they will rise but won’t get brown and ideally will have crunchy outside and soft inside (just as macaroons). I want to include special thanks to my friend, Wiola, who helped me to translate the old cook book instructions to bake slowly in a moderately hot oven into modern terms of time and temperature, and to my lovely 7-year-old neighbour, Isabel, who volunteered to taste the treats and decided: “They are nice.” Hope you will enjoy them too. There is a huge number of things, and chores I do in the meantime. I wash the sink while brushing teeth. I polish my nails when watching a film. I plan blog posts while walking the dog. A lot of my projects also seem to be done in the meantime. I plan them for certain week or month and simply make myself find the time. A few minutes here, a half an hour there not to mention all the surprisingly expandable late evenings. I can’t help but smirk when I think how much time I can actually steal. Obviously, as life goes on and priorities kick in, my feel-good, me-time projects often get delayed but if I pencil them in the diary they eventually come about and turn out well. The project that I present below also had to be postponed, mostly due to the self-inflicted, do-it-yourself living space renovation but the time has come and I am very happy to share it today. 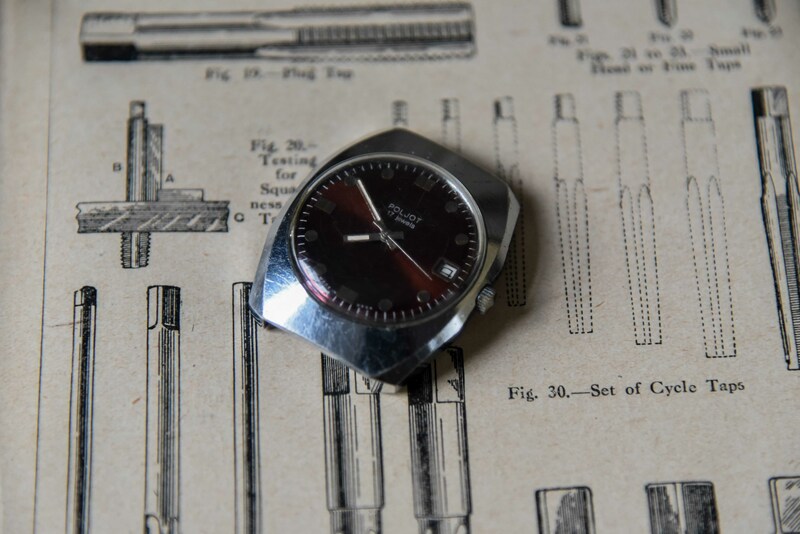 The whole project was inspired by the man who loved to repair the watches. Bogdan had a great precision and appreciation of fine things and loved to bring watches back to their shiny ticking life. With a set of tiny watchmaker screwdrivers and a polishing cloth, he mended the clockwork mechanisms, put the springs back in place and buffed the cases. 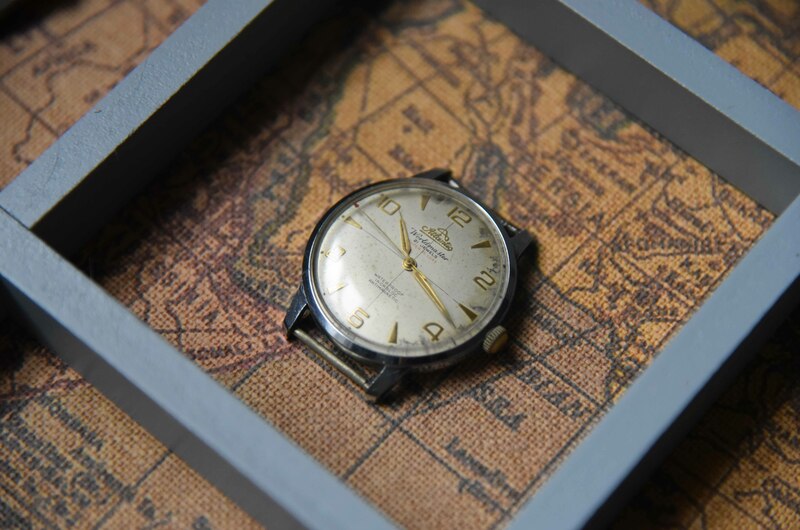 Those watches may have gone out of fashion and their past owners may have forgotten them, yet once you wind every single one of them , it will still tell you the time as it would decades ago. I like to look at the watch and think of all the routines, events and occasions it once reminded of. Time to start work. Time to go to church for Sunday mass. Time to tune in to the TV news in the evening. Time to attend the parent teaching meeting. Time to leave for the post office and pay the bills before closing. Time to catch a train. A quick glance at your wrist and you know where you should be. The love for watches must come from the respect of time. Making time for important things. My father-in-law loved watches and I honestly do not think I have ever seen him without a watch on his wrist. Honestly, just look at the pictures. What makes the story extraordinary is that, for some reason, Bogdan mended and kept watches of all sizes, of various makes, of steel, silver and platinum, of great and no value. Why would he collect watches all his life? 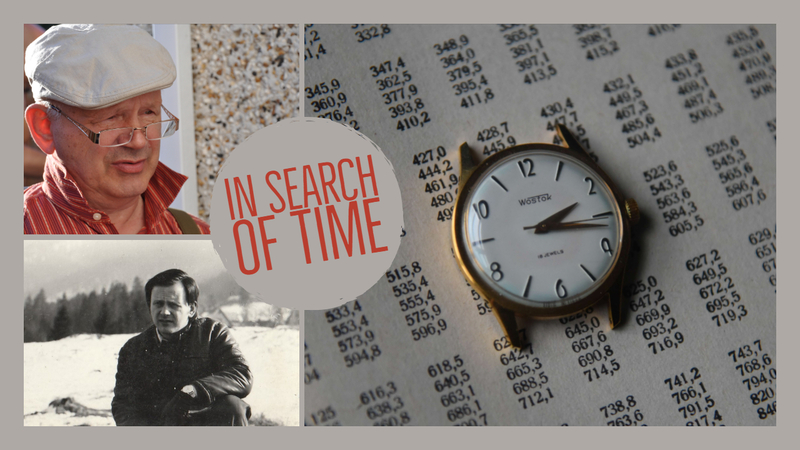 Was it the appreciation of the past time that the watches once measured? Was it the fact that a watch is a perfect symbol of being well-organized? Or was it the sheer belief that time is precious? 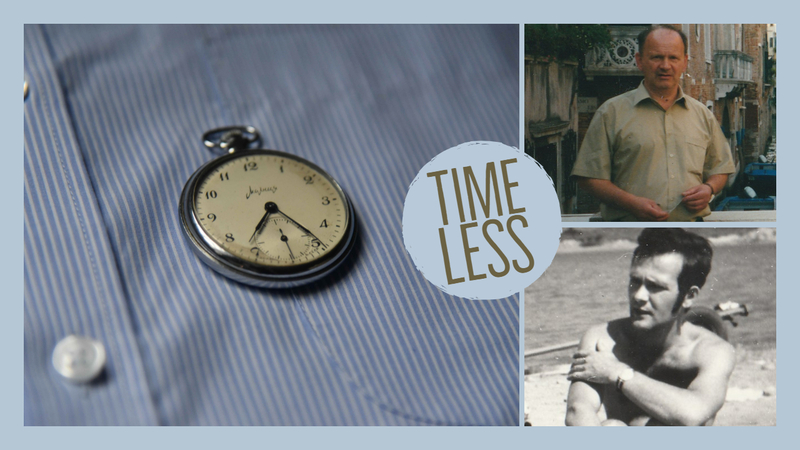 What we know is that he was proud of his collection and when we inherited a rather large storage tin full of old watches I wanted to find just the right way to pay tribute and I knew exactly what I had to do. This collection could not be kept in a box. It needed a proper display. It had to be framed. 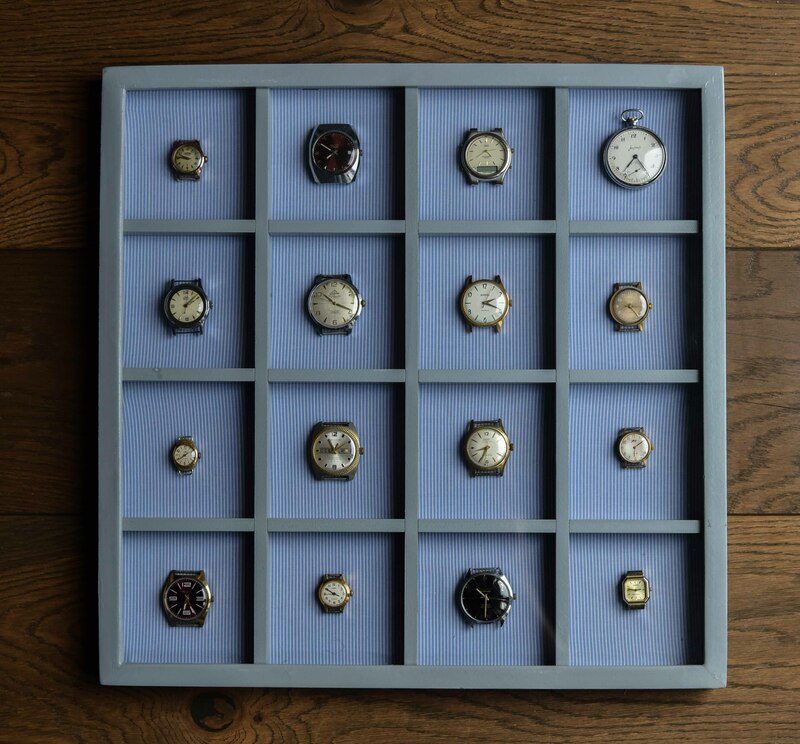 As much as I wanted to use every single watch, I realized that the composition needed to be symmetrical, systematic and structured and finally after hours of debate and rearranging I chose the 16 watches to be mounted onto a multi frame. 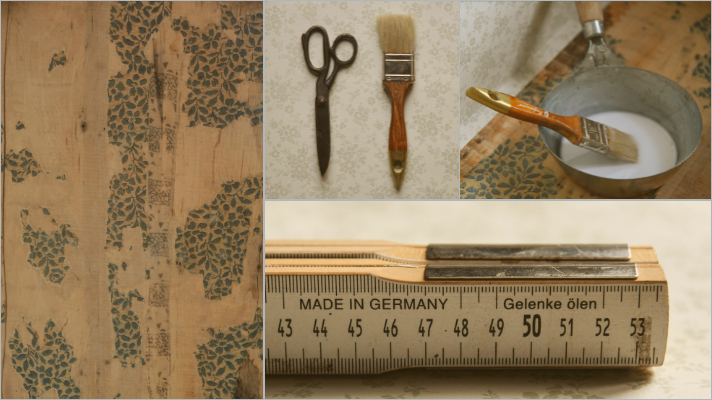 Then I tried a few different backgrounds – yellowish book pages, a vintage map, a patterned shirt. Again, the opinions were divided but eventually we agreed to go with the most memorable choice of all, mainly one of Bogdan’s striped shirts. Once all the big decisions were made all that was left was a bit of crafty DIY. I stretched, smoothened and secured the background fabric to the back of the frame with some staples. Then I aligned the watches and used the hot glue gun to fix them. The glue gun works just perfect here as it sets in minutes, gives a really strong hold and, if there is a need, can be easily removed with no damage to any of the watches. 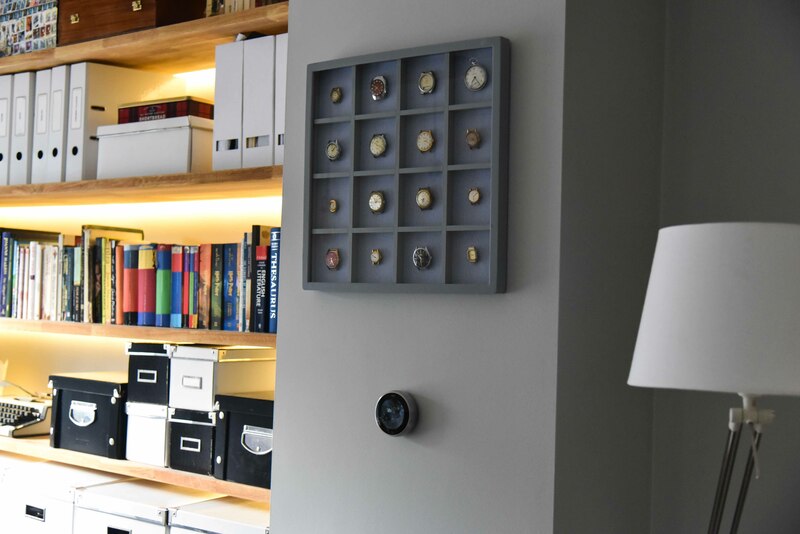 We hung the watch display in the living room and it reminds us of the good times and to use our time well every day. 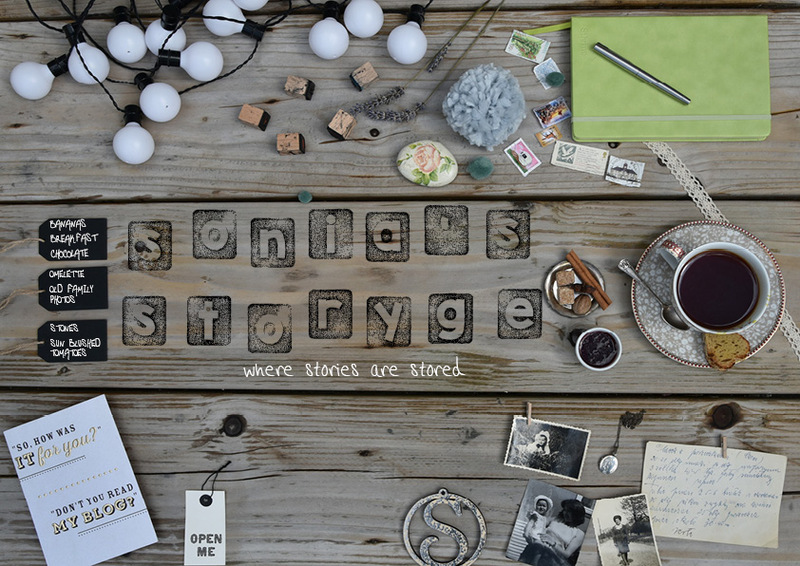 Do you have the memorable keepsakes that you do or would like to display? Wishing you lots of meantime for all the projects you have in mind. It is always hard to pinpoint this very moment when Christmas time is over. For some it’s literally the next day, for some it’s the start of the New Year, for many the Epiphany and for some it lasts as long as the carnival. I am not usually eager to declare Christmas over and put away the Christmas decorations so I tend to hang on to them through the first week of January slowly putting away bits and pieces, sorting through the keepers and the scraps and getting the storage boxes filled. 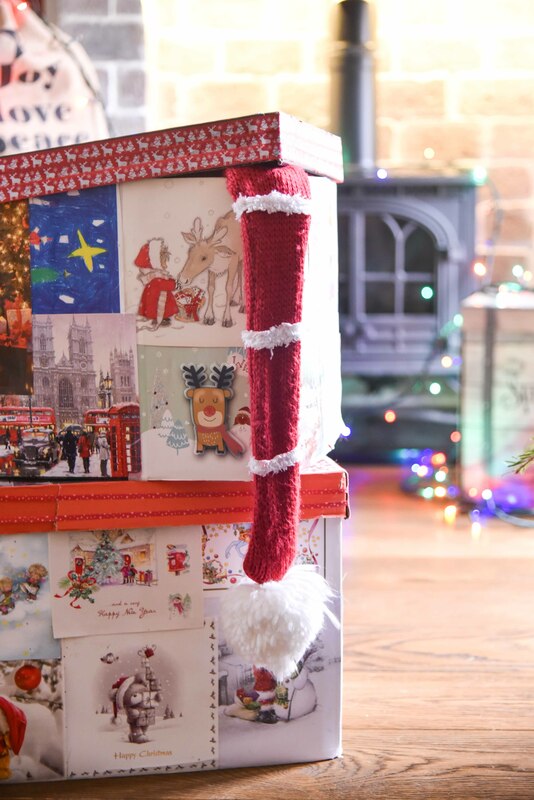 As I love Christmas cards and appreciate their beautiful and detailed festive design I always felt bad to be getting rid of them after Christmas. 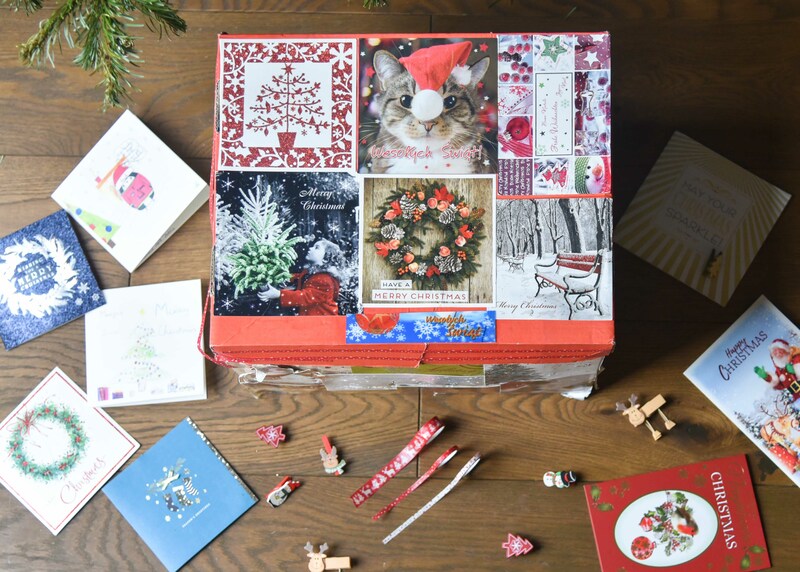 Then again, I did not want to keep a box filled with old cards just for the sake of it and this is how the idea to make the Christmas decorations storage boxes came about. 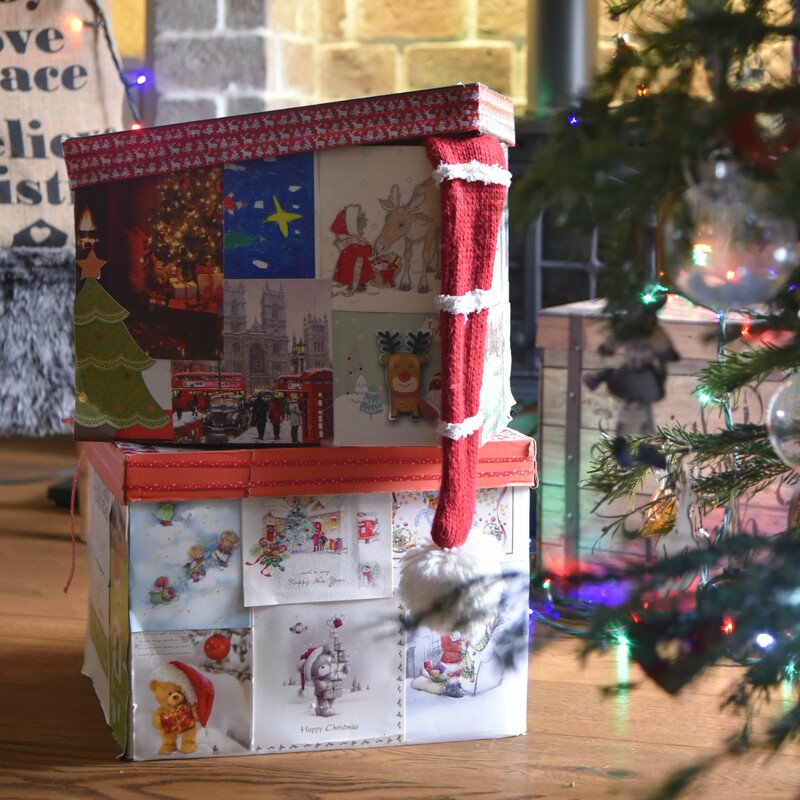 A perfect way to store all (and ever growing) Christmas bits and bobs and keep the cards received over the years. All it takes is a medium size cardboard box, lots of Christmas cards in various sizes, paintbrush, scissors, PVA glue and sellotape. It is a family friendly type of arts and crafts and a great way to get creative and finish off your Christmas season. We use different cardboard boxes – the archive boxes that come with a lid, the ordinary manila shipping boxes and the festive gift boxes as well. We start with cutting the front pages of the cards. Then we get crafty and try to spread the cards on all sides of the boxes so that they fit and cover the entire space. We do a quick preview and a little swap here an there and then start gluing the cards. It works best if you prime the side of the box first, then brush the back of the card, stick them together and press to make sure all is well bonded. I finish the boxes off by putting a strip of sellotape on the edges. You can hardly see it and it will make your box sturdy. Now all there is to do is to fill the boxes with all those baubles, stars, reindeer, and angels, not to mention the fairy lights, and store them safely till December. Hope you will enjoy making your Christmas storage boxes. Let me know how are you getting on. The recommendation for this cake came in one of the most unusual and unexpected way. 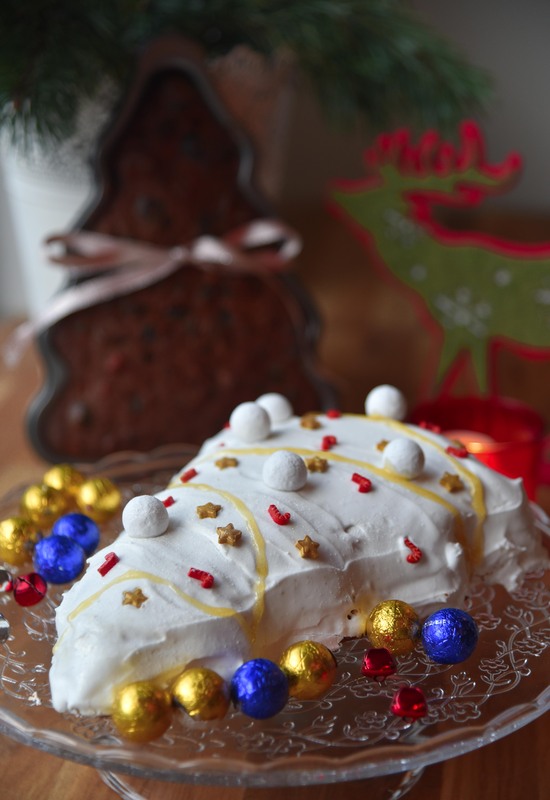 Yet, it was so authentic and heart-warming that I ventured to make, for the first time in my life, a typical Irish Christmas cake this year. I have quite a good collection of the recipes I got at work including the Christmas recipes here but this time it was not taste or look that inspired me but simply a phone call. It was the middle of December and it was feeling very much festive around the office. I was working at television and happened to answer a random call from the viewer. The lady was calling just to say how grateful she was for the recipe for the Christmas cake by Catherine Leyden that she had seen on Ireland AM. She was a typical thoughtful and caring Irish mummy and told me a lovely story of her baking the cake well in advance, as you would, and sending it to her son in the States. She told me what a great success the cake turned out to be at the Christmas table overseas and noted that her son insisted on her making this exquisite cake for him every year. Indeed, there are many things you can love about the cake – rich almond flavour, brandy infused moisture, scrumptious cherries and nutty texture. 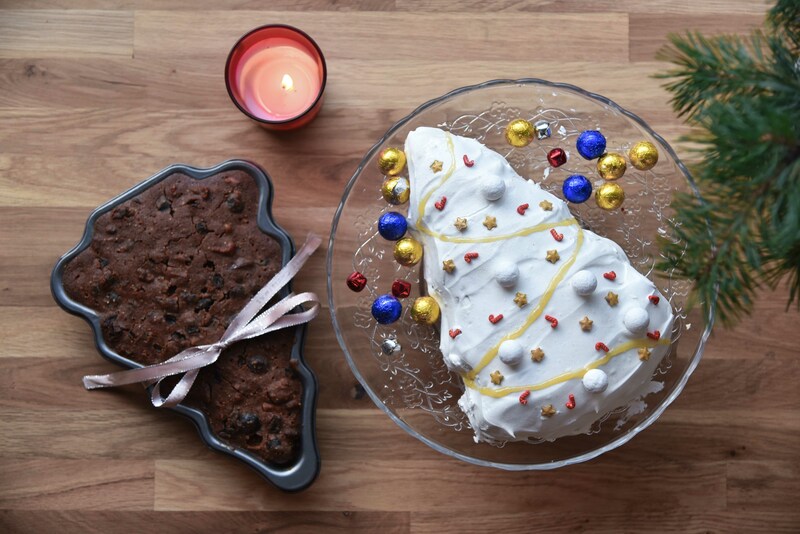 I have made two Christmas tree shaped tins of the cake this year and with one gone already I can only hope the other will keep till Christmas. Put butter, icing sugar, sultanas and other dried fruit, orange zest and juice and half of the brandy into the large saucepan. On a low heat bring it to boil stirring every now and then to mix the ingredients and make sure the butter is melted. Take off the heat and leave to cool for about 30 minutes. Once the mixture has cooled down, beat in the eggs and add nuts, ground almonds, flour and spices. Pour the mixture into greased loaf tins (or Christmas tree shaped tins) and put in the middle of the oven for about 1 hour and 25 minutes. Check on the cake after an hour and if too brown cover with the baking paper. Check with the skewer – if the cake is ready it will come out clean. Take out of the oven and leave for at 5 -10 minutes. Then – with the same skewer – make little holes in the cake and pour over the remaining brandy. The cake will literally soak it in. Leave the cake (or cakes) to cool and then take out of the tin and wrap in the layer of baking paper followed by a layer of foil. Store in a cool and dry place until you are ready to decorate. You can also watch how to make the cake here. The cake can, and should, be stored for a few weeks to get rich and flavoursome. To decorate roll out the almond paste and cover the top and sides of the cake. Leave to settle, once you are making the icing. Beat the egg whites with lemon juice until foamy. Then gradually sieve in the icing sugar. The mixture will look very much like meringue and will be stiff yet quite plastic and shapable. Spread the icing as evenly as possible and smooth with a spatula. 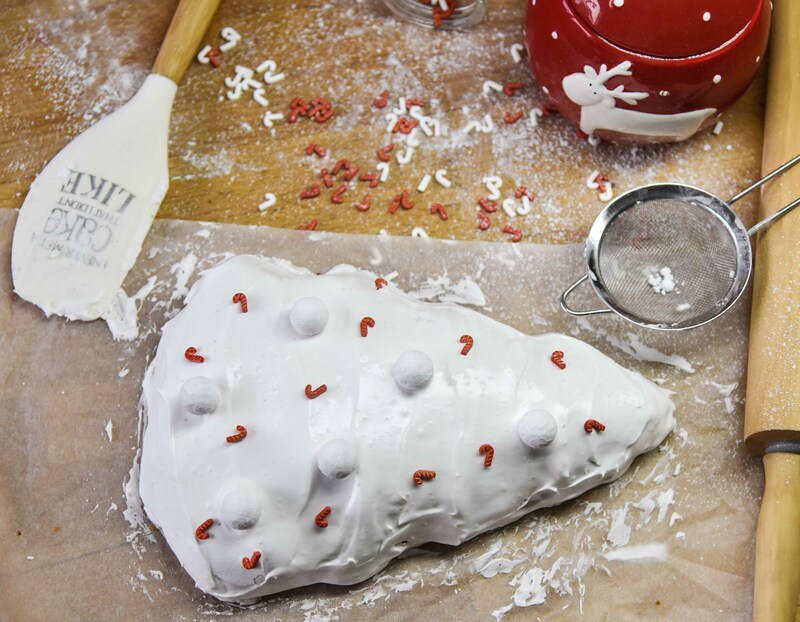 Add little sprinkles or chocolate shapes to make it festive and leave to set for about 2-3 hours. Place on the platter or cake stand and serve to your guests. Orange might not be the most Christmassy colour, yet to me oranges are very much part of the festive season. Many Christmases ago when they were still very exotic and unique, not to say scarce, we were very lucky to get a few from Santa. 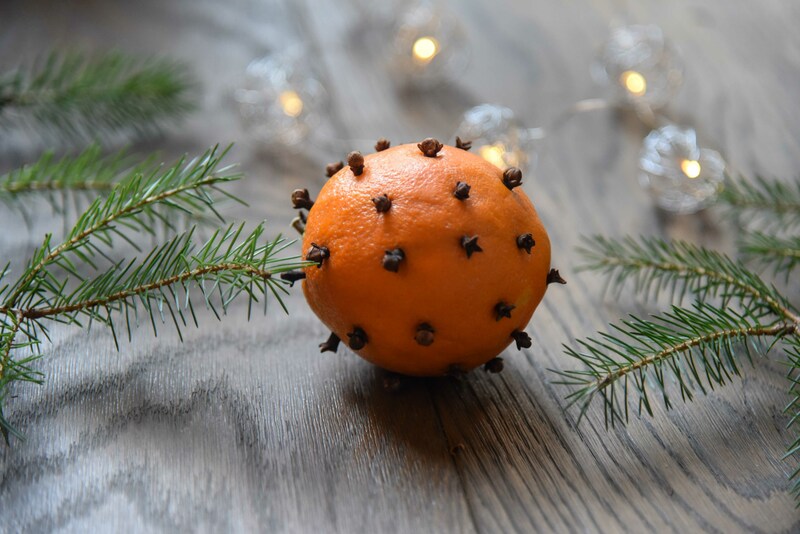 I think they make a great December treat – they are sweet and tangy, they are fresh and in season. 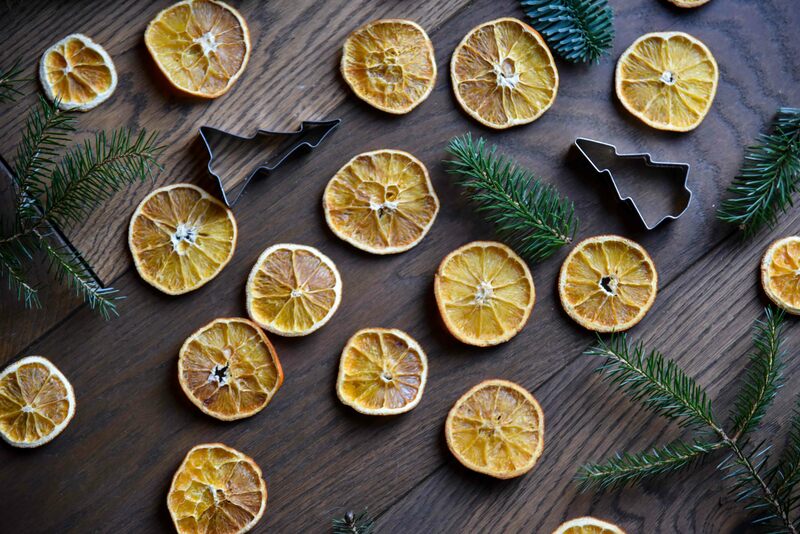 I love the smell of oranges around the house at Christmas and this year we used oranges to decorate as well. It does not take a lot of time at all and it fairness does not cost much either. Firstly, we stubbed a few oranges with cloves and spread them around the house. They look really nice and as they dry out they slowly release the zesty smell infused with cloves. A perfect Christmas scent. Then we made some orange rings to hang on the Christmas tree. You simply slice the oranges rather finely, place the rings on a baking tray and pop those into a warm oven set to 80°C – 100°C for two up three hours. The exact time depends on how thin and juicy the slices are so you will need to keep checking on them. Once out of the oven it it good to give them some extra time to cool and get firm. They will have a lovely semi-transparent mosaic-like inside contrasting with the deep orange citric outside. 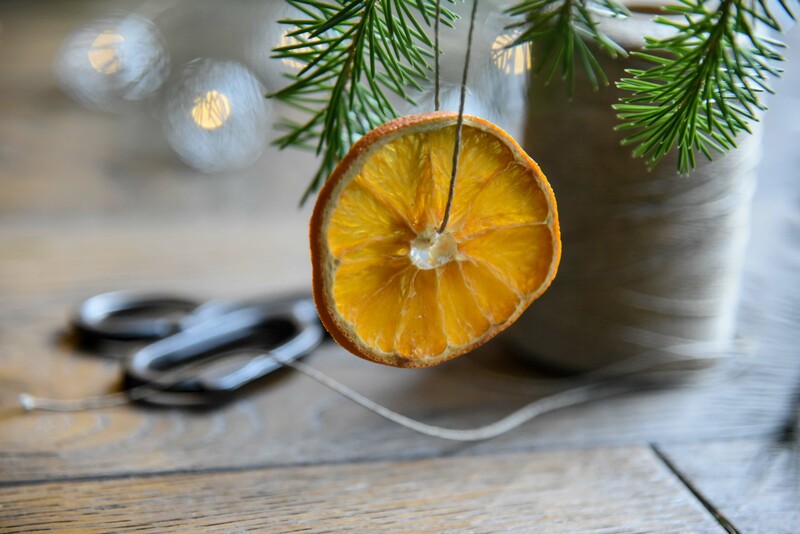 All you need now is a piece of string to hang them on your Christmas tree. When the war started in September 1939 everyone expected harsh and challenging times. Yet, the life turned very quickly from bad to worse and than finally miserable. Today, I will try to retell the story of my husband’s grandparents who were just teenagers at that time and had barely finished their primary school. They were in their best years, yet had to spend their youth in the rough reality of war. Gienia was the middle child in a poor family. 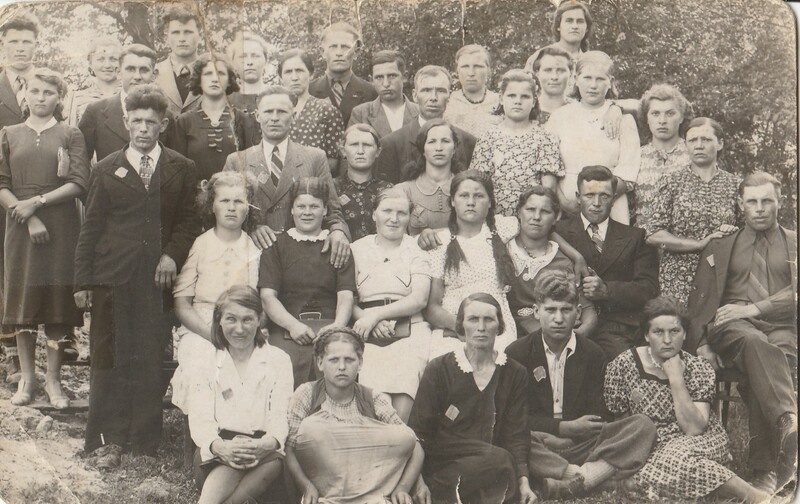 After her father Jozef died, they lost their home and Gienia had to start working at the age of fourteen to make the ends meet and support her mother and younger brothers and sisters. She left school and found a job as a housekeeper at a German tailor’s family. She was well-organized, neat and eager to work and she quickly picked the language too. 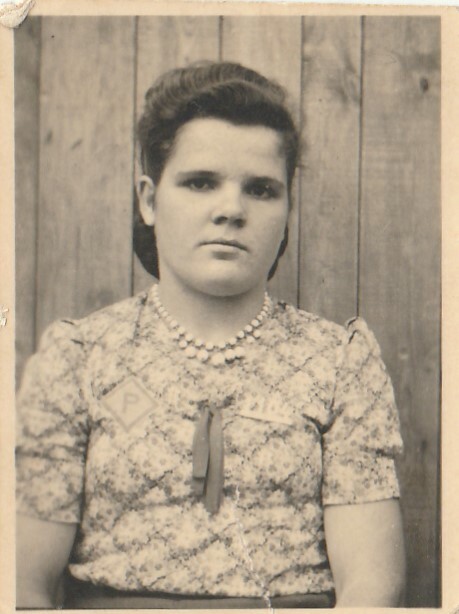 When in the winter of 1940 the German authorities came knocking on their door requesting that each Polish family would comply with the order and send one of the children to work for the Third Reich, it came at no surprise that Genia, who could speak good German and was clearly a strong survivor type was chosen to go. With a heavy heart her mother picked her as she knew that if anyone can make it there it will be Gienia. So the 15-year old girl was taken away from her home and family and sent on a train 125 km west to work for the enemy’s welfare. Many thoughts crossed her mind when she was travelling on the train on a cold January day. Will she ever see her family again? What will she be forced to do? What will happen to her? Will life ever get back to normal? 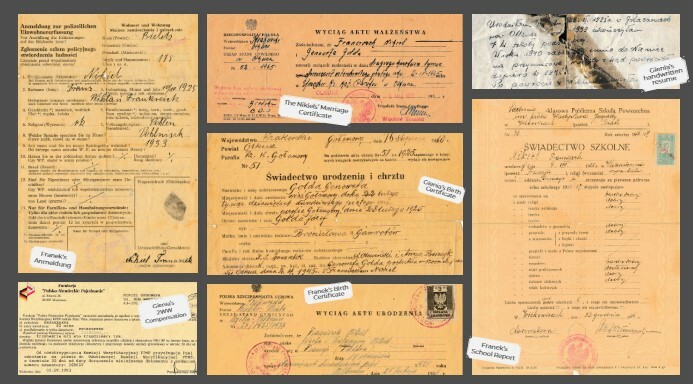 Once their transport arrived they were all listed and each boy and girl received a square patch with a letter “P” to mark them as the Polish labours. Then, they were told to line up and one by one they got selected by the local farmers, manufacturers and entrepreneurs. Once this peculiar job market was finished, the newly assembled groups headed to their new destinations on trucks, carriages or simply on foot. Gienia was selected to work on a farm in the nearby village of Giessmansdorf in Bunzlau. 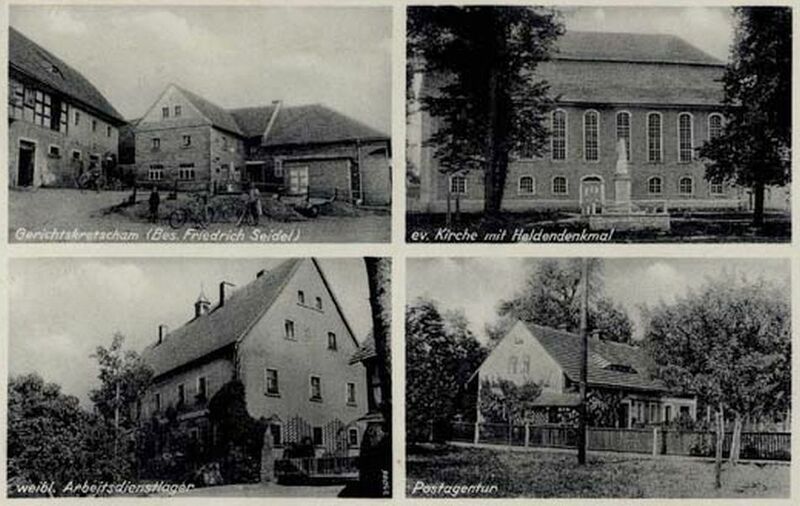 The farm belonged to Gerhard Nagell and was a big complex with acres of agricultural land for growing rye and potatoes, barns with cows and pigs and sheds with ploughs, sickles, shovels, rakes and forks. Every day Gienia would get up before the dawn. She would feed the animals, milk the cows and cook breakfast for the farmer’s family. Then she would clean the barns, stables and sties. In spring and summer she would work in the field for the rest of the morning. The afternoons she would spend in the kitchen cooking the evening meal on the huge wooden stove for everyone on the farm. Everything was scarce yet, of course, the menu for the Germans and the workers was somewhat different. While the workers’ staple diet was potatoes and kasza, the farmer’s family would get milk, butter, cream and occasional meat. It was hard work day after day, yet the girls and boys working on the farm were allowed the little pleasures, treats and time off. For the pocket money she received every month, Gienia would go to the village to the hairdresser. She could write letters home to her family and even sent them a photograph taken at the professional atelier. Every Sunday they would all dress up and walked to the church for the Sunday mass. It was there that Franek spotted her in the crowd. She was a good looking young woman. Her black eyes big and sparkling and her black hair pinned immaculately in a bun. 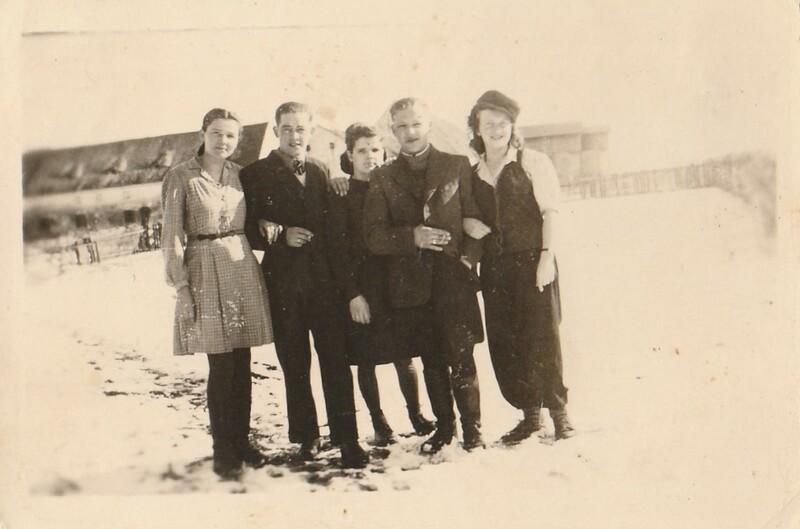 Franek worked in the factory in the nearby village of Seifersdorf and shared the same faith as many other young Poles during the war. 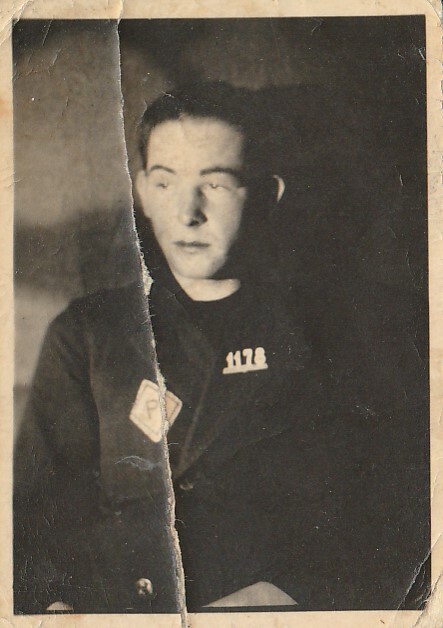 He was taken from his home, school and family, brought to Germany and forced to work. He had always been fascinated by machinery and mechanics and was a good driver so he always volunteered to deliver a brick-loaded truck to the town or to run a few errands around. When Franek saw Gienia that day in the church, he knew he needed to make a move. As the girls and boys slowly walked out of the church he came as close as possible so that he could hear her voice and laughter. The next Sunday he stared at her so intensely that she could not help noticing and when she turned her head their eyes met for the first time. Gienia did not seem to care too much for his interest, though. She was very popular and always surrounded by the bunch of boys, yet Franek, charming as he could be, slowly but surely won her over. He would come by the Nagell’s farm, sometimes on errand and sometimes just to say “Hi”. In the summer months he would pick wild flowers on the way for her. He was nonchalant and cheeky in a sweet boyish way. They talked and they laughed, they found all the things they had in common and made promises and plans for their future together. One day the farmer organized a public screening. They set up the projector in one of the big rooms in the house and it felt as if there was no war, all things went back to normal and people would just go to see the movie in their leisure. Gienia and Franek were crouching at the back and watching – with goosebumps – a film for the very first time. It was December 1943 and it had been almost three years since Gienia was taken to work in Germany. The life at the farm was not as bearable as before. The farmer, who was a firm but fair man, was conscripted to the army leaving his Nazi influenced wife in charge. She despised Gienia and was determined to make her life as miserable as possible. She gave her extra chores and never approved of her work. She harassed her and made her cry. 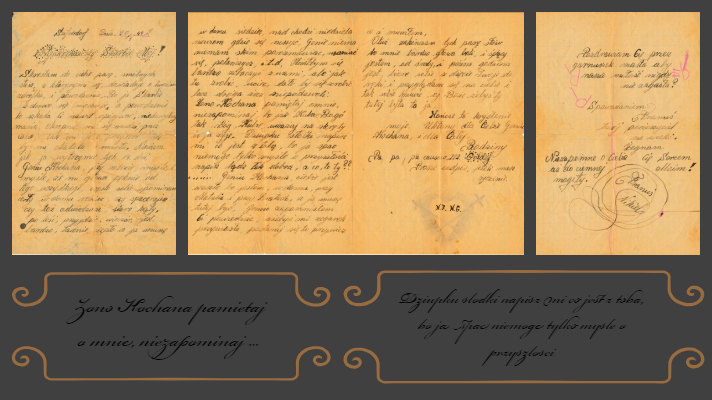 Gienia was on a verge of breakdown and if it hadn’t been for the old Herr Nagell, the farmer’s father who was truly fond of this kind and hard working girl – she might not have survived the war. It was nearly Christmas and the farmer’s wife went away to spend the holidays with her family. Gienia went to the town for some grocery shopping. As usual she would take her “P” letter patch off and everyone would take her for a German lady as she spoke perfect German. When she was passing by the train station she heard the announcement that the train to her homeland would be leaving in 15 minutes. On a spur of the moment she decided to buy the ticket and boarded the train. The mixture of fear and excitement filled her heart when she was travelling east listening to the chugging sounds of the train and getting closer home with every single station they passed. When she arrived at her destination, the German police asked her for her documents and as she had none she was immediately detained. She managed to bluff her way out of being executed on the spot and convinced the authorities that she was on a leave heading to visit her long time not seen family. It took one phone call to seal her destiny. When the old Herr Nagell answered the telephone he confirmed she was allowed to travel. 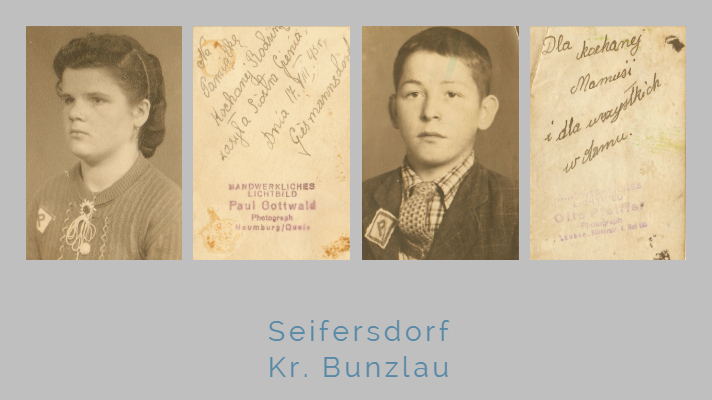 He arranged all the paperwork and forwarded it to the police and so Gienia not only was miraculously saved but could spend a month with her mother and siblings before returning to the farm in Giessmansdorf. I write to you these few sad words and I am asking for your health and well being. Because, I, my dear, do not feel well and it would be a waste of time even to describe how miserable I am. It’s unbearable. I am awfully dull and sorrowed as if my mother had passed away. I do not know how I will survive these fourteen days without you. Gienia, my dear, when I work I keep thinking and thinking and it feels as if my head is going to explode. I often wonder what you are doing at home. Do you go on walks, do you visit old places? When the evening comes, it might be nice and mild but I stay at home. On Sundays I do not know where to go as you are not here and I have no one to talk to or to dance with. I wish I could see you all but how can I? I could run away but on the other hand … My beloved wife, remember me, do not forget. Fear God. What goes around, comes around. Beware the treacherous paths as I am still alive. My angel, please write how you are as I cannot sleep and only think about the future. Please be so kind. My love, you are happy as you are at home with your mother and brothers but I have to be here. Gienia, I forgot to ask you to bring me the watch. Please try to bring what I told you. I now finish those few words as my head aches and I feel really tired as it is late at night. 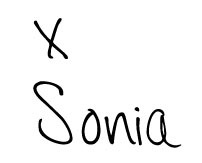 I look at your photo in my hand and I wish to God you were here. A few days later Gienia came back to Giessendorf. When Franek heard the news he came running to meet her. It was a wintry evening, the air was brisk, he trudged through snow and fell into frozen paddles as the ice broke under his steps. When he got there he was out of breath, his clothes were wet and soiled, his hair dishevelled but it did not seem to matter at all. His cheeks were red, his heart was pounding, he got down on his knees, pressed his head against her lap and promised to never let her go again. In February 1945 all the workers were liberated by the Soviet Russian soldiers. Franek and Gienia walked over 100 km back to Gienia’s hometown of Cieplowody where they got married in April that year. 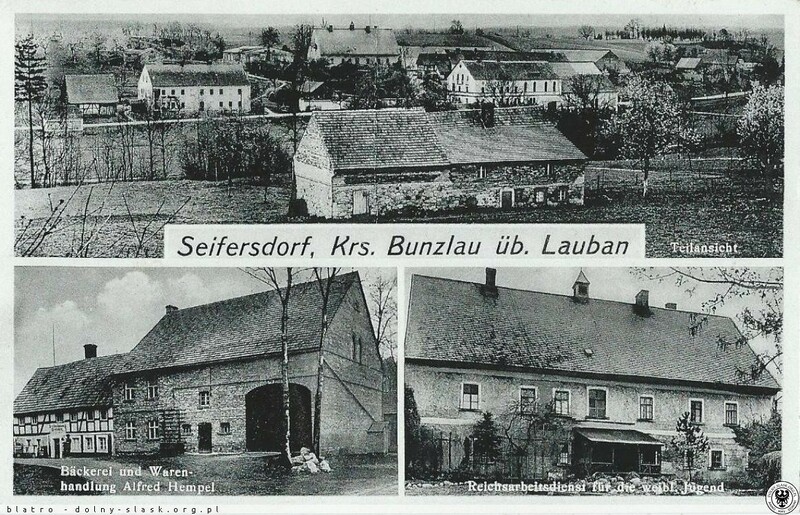 A few years later they moved to Wilkowice near Bielsko Biala to live with Franek’s family. They stayed in Bielsko till the end of their lives. Thank you to everyone who went down the memory lane with me and helped to find bits and pieces of this story. Every household has its own unique kitchen hacks and tricks. Little smart habits we mostly do automatically that save time, help to prevent waste or just make things better. While at this stage all these simple things seem quite obvious to me, I still think they are amazingly useful and worth sharing and trying. I had a pleasure to be working on the photos for this post with Marysia from the blog Pychotkowo and I want to thank her for all her help. 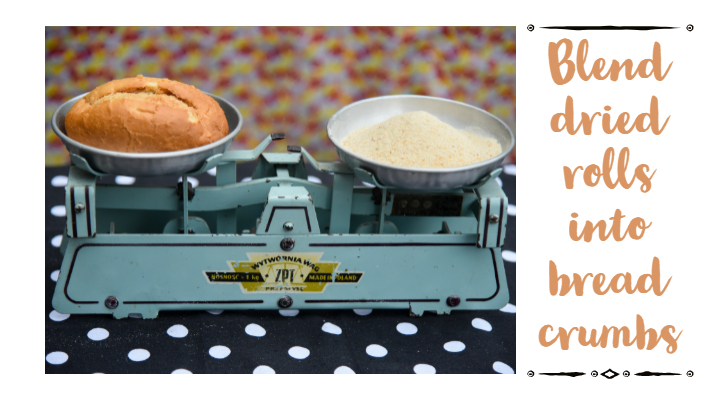 Here is my list of 10 kitchen hacks that I picked, well, along the way. They are listed in no particular order and each of them is well tested and sound. I hope you will find them as practical as I do. Funnily enough, this is the kitchen trick that I learnt while working in the office and in fact, this is one of the most important experience that my boss shared with me. She insisted that tomatoes should never be kept in the fridge as rather than being preserved they loose all the flavour. Well, she was right and the proof came in the taste. I never keep my tomatoes in the fridge. Instead they are stored in a wooden bowl and if anything they only get ripe and sweeter. 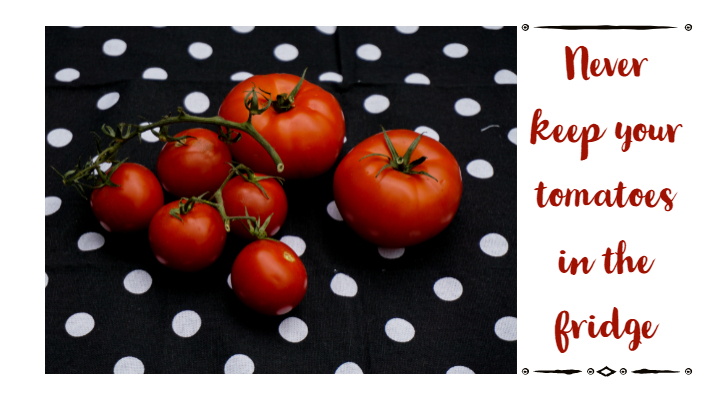 We do eat plenty of tomatoes in our house and they are hardly any that get old or crinkled but if I see any I roast them and add to the tomato soup to make it rich and more flavoursome. Bananas are a bit tricky to store. They do not like the cold of the fridge and they do not like the company of other fruit or veg. What is more, they do not keep long, get the brown spots quickly and turn brown within days. On the other side, once they are ripe they have more antioxidants, are sweeter and easier to digest. 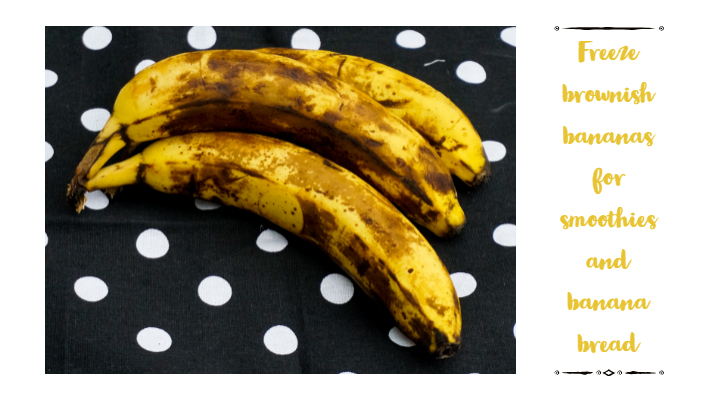 I hate any waste in the kitchen and could not bear not using the brown and overripe bananas. Especially, they are perfect for banana bread or smoothies. However, rather than baking banana bread on a weekly basis, I peel the bananas, put them in a sealed bag and freeze for later. Vinegar has been used in the households for ages and then quite suddenly and sadly forgotten and pushed away from the cupboards by more fancy and professionally manufactured kitchen chemicals. 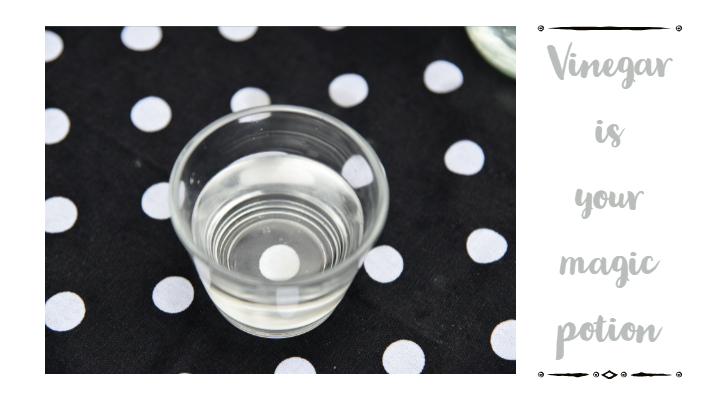 I find it underestimated and essential and I always have a bottle of distilled crystal clear vinegar as it comes in handy on so many occasions and seems to be the remedy for so many problems. It is great for cleaning greasy glass, treating various stains and removing stickers and decals. We also use it to remove splinters. Just soak the affected area in vinegar for 15 – 20 minutes and the splinter will either slide out on its own or can be easily removed with tweezers. Also, due to its antibacterial qualities it it effective in treating verruca. 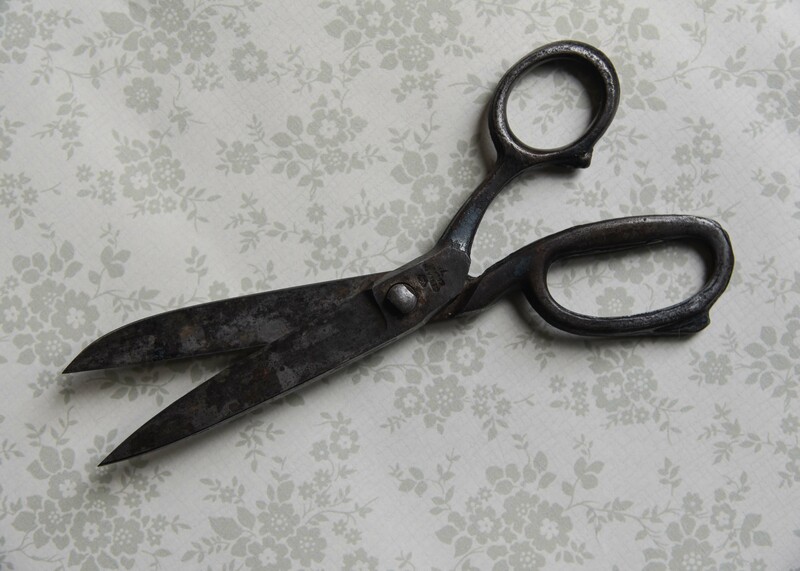 Just dampen a little bit of cotton wool in vinegar or apple vinegar, press against the verruca, secure closely with a duct tape and leave overnight. The treatment might take up to two weeks but so far it has never failed to work. And in case you wonder what else you could use vinegar for this article here will give you plenty more ideas. This is just my way of trying both: being eco-friendly and minimizing the waste. It is truly useful when cooking tomato sauce or tomato soup as you need to add the water anyway. 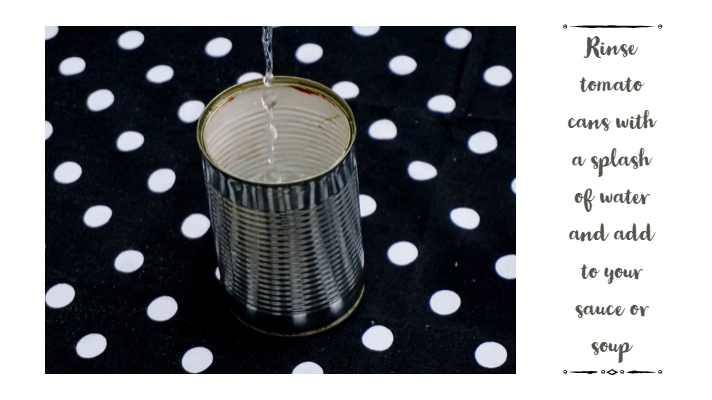 Obviously, while I add at least one full can of water to the soup, you will only need a quarter of a can for your sauce. I do go a step further and add a splash of water into my almost empty jar of mustard or mayo and use the jar to mix the salad dressing in. 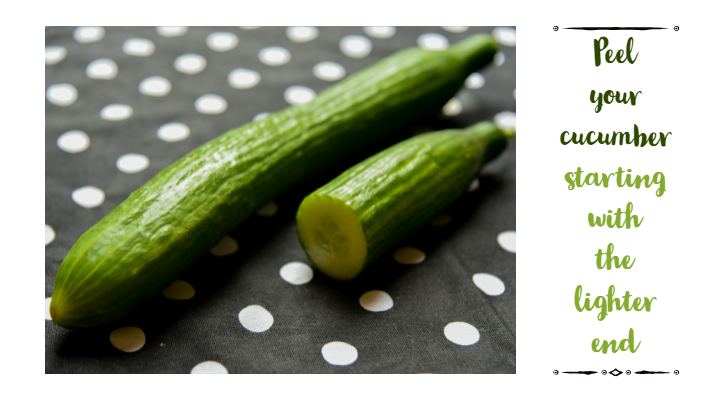 Did you know that the darker green end of the cucumber is more bitter? Therefore, I always start peeling the cucumber at the lighter green end. That way I do not spread the bitter taste and keep it right at the end where it should be. I must admit that I could never remember which end I should start at and was often wondering: light or dark? Until I came up with this little mnemonic trick that sorted it once and for all – Let’s start with Light green. I admit I can be annoyingly pedantic sometimes and surely sorting forks, knives, tablespoons and teaspoons shows this side of me. 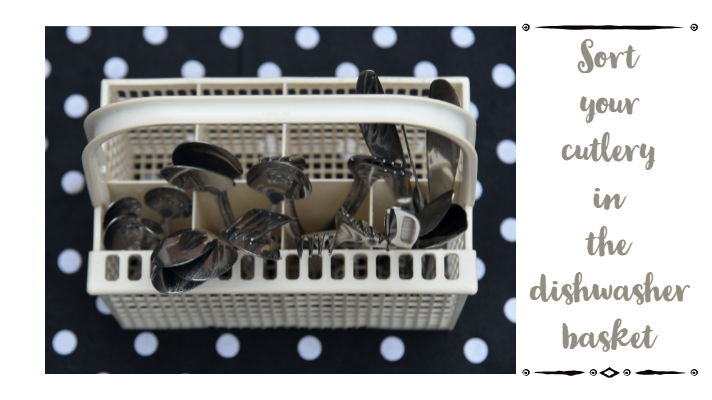 However, this hack proves very time saving as once all your cutlery is washed and clean you just transfer it one to one, container to container, dishwasher basket to cutlery tray. I was actually able to talk my friend – Wiola, into it and she now would not do it any other way. We all know how tricky it can be to get this moment when your avocado and mango is not too hard and not overripe but just right. Apparently, if you roll them a few times it can make them juicier and ready to eat, so I always do. Why didn’t I come up with it earlier, I wonder. Possibly, I did not have a really powerful blender that does the job in the matter of seconds. Every now and then when the rolls get stale I keep them to dry out and then after a week or two I pop those in the blender and get a very fine bread crumbs. Honestly, we never ever bought bread crumbs and always make a good use of any left over rolls and baguettes around the house. While bread crumbs seemed a natural solution, it never occurred to me that you can actually make your icing sugar in the very same way. I only learnt you can easily turn caster sugar into icing sugar when I went, as neighbours do, with a regular “can I borrow a cup of sugar” visit and Kasia, my neighbour, showed me you do not need to store both at home as the blender will powder your regular caster sugar so that you can use it for baking and decorating. This is the best home made peeling ever that I picked ages ago from a girls’ magazine. I must say I never used anything else. 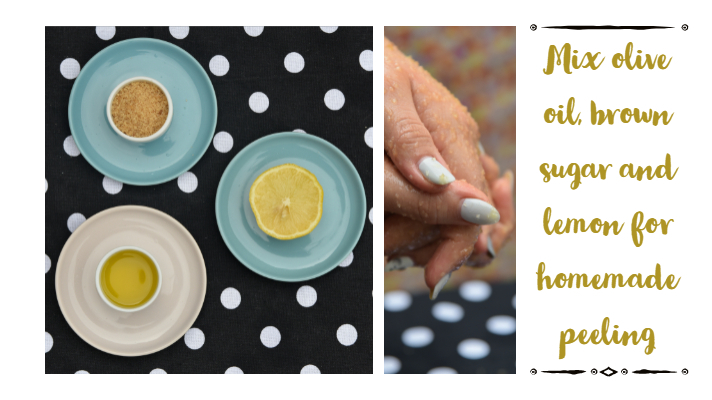 It leaves your hands soft, moisturized and pale as sugar removes any old tissue, oil makes the skin nourished and lemon gets rid of any red stains. I would love to hear what your kitchen hacks are and I am really looking forward to your feedback and comments. Walk a mile in someone else’s Dr Martens and you will never want to give them back. 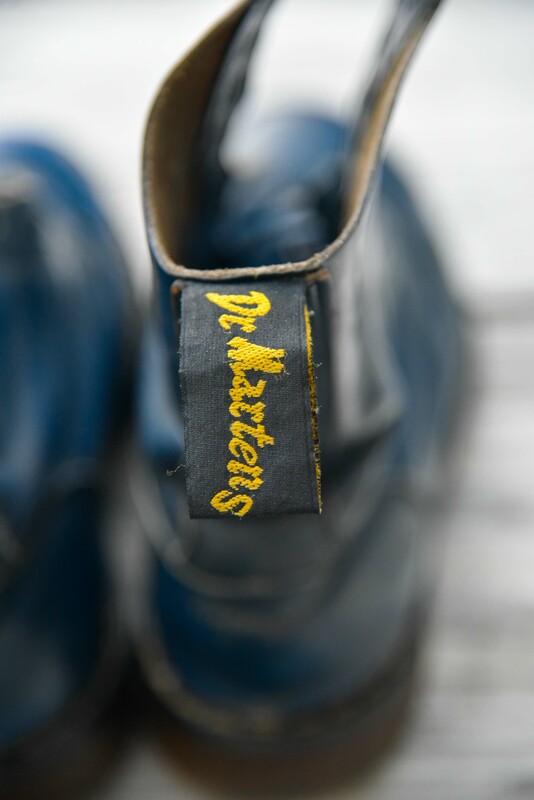 My first pair of Dr Martens was navy blue ten eye size 4 boots that I bought with the money I earned working as a copy girl over the summer. The job was rather boring and involved long hours but it let me saved just enough to finally be able to afford my dream shoes. And once I got them, I would never want to take them off and I was literally wearing them everywhere, for every occasion and all seasons. In my teenage opinion they matched sleeveless chiffon mini dress, oversize dungarees and corduroy bootleg trousers just as perfectly. With no shoes I feel weak and vulnerable. I’m ashamed of my bare feet and get even more uneasy wearing socks only. Shoes give me confidence. Soles give me strength. It means I am always ready to run. There is a very well-preserved tradition in Poland that a visitor takes of their shoes. I never was able to understand the reason behind it and always thought that as long as you wipe your feet and are not wearing muddied wellies, drenched squelching trainers or insulated snow boots you should keep you shoes on, as they are the part of your outfit. To me the respect to the host would not come from leaving your shoes in the hall. On principle no one takes off their shoes in my house. 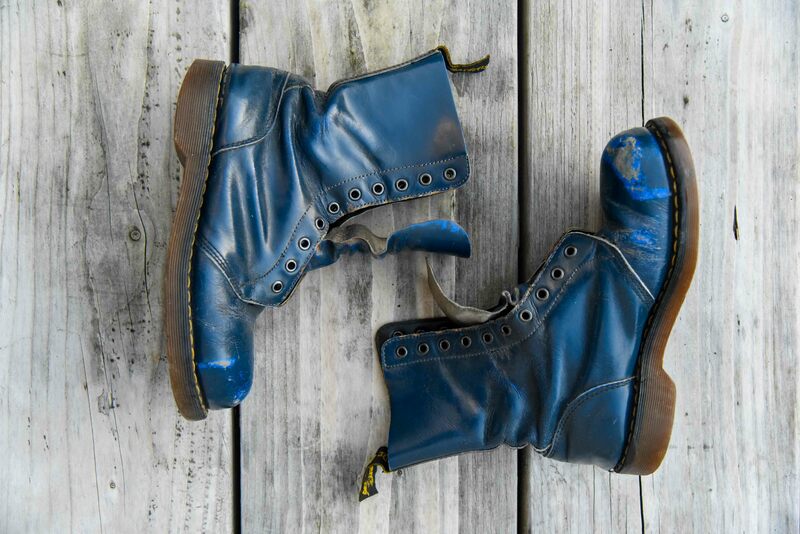 We all had our Dr Martens at the secondary school, well most of us did. 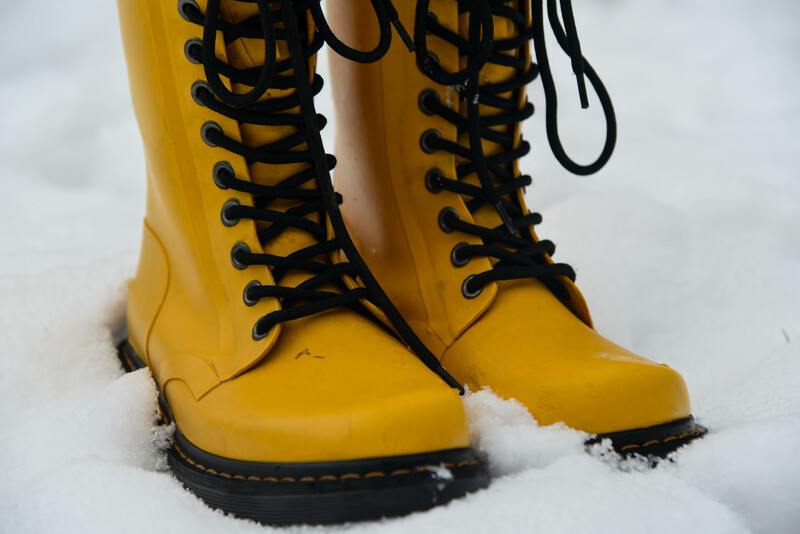 While boys were quite happy with just the black ones, each of the girls had their own colour – cherry red, blue, yellow, white … Not having a school uniform, we felt the boots united and distinguished us. 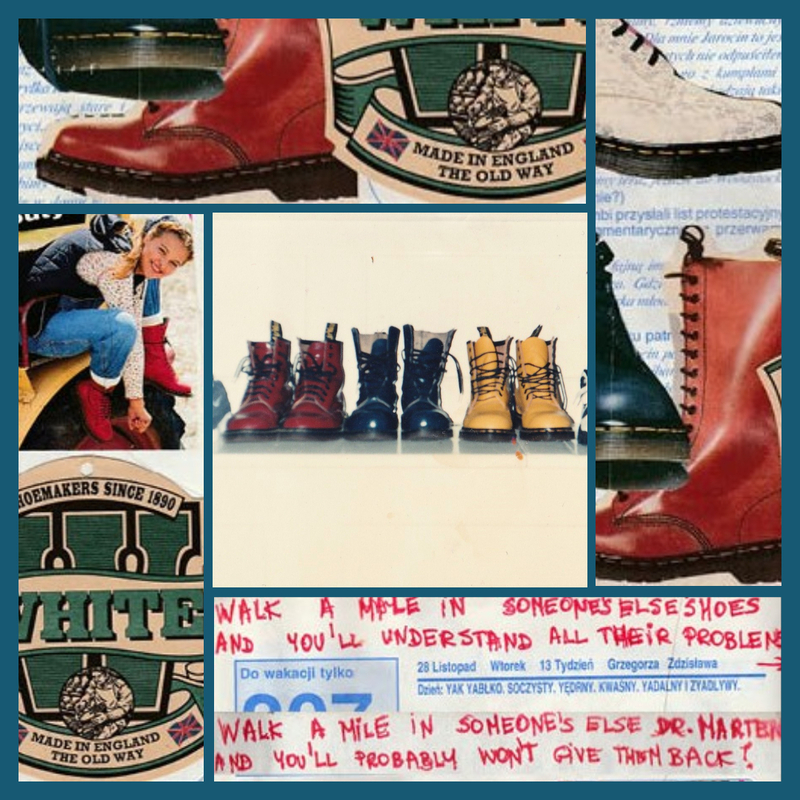 There is a picture of our collection of Dr Martens in all colours that I took years ago during a trip to the UK. In fact, as many a time it was the actual photo that inspired me to write this post. As luck would have it, it got lost and even though I searched high and low I could not get my hands on it at the time of publishing. Now that I eventually found it, or rather very randomly came across, I can finally add it and tell you the whole story. What shoes would you walk a mile in? 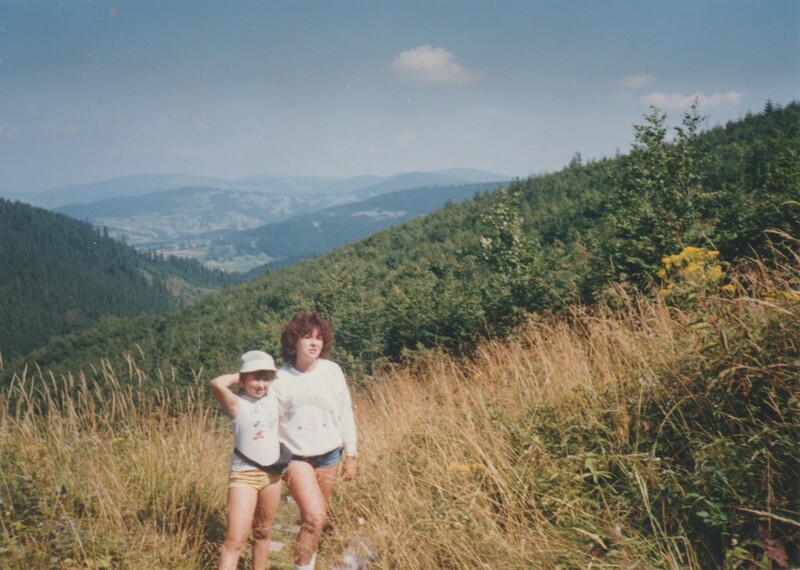 It was always the last weekend of the summer holidays that we went to the Beskid Mountains to pick blueberries. 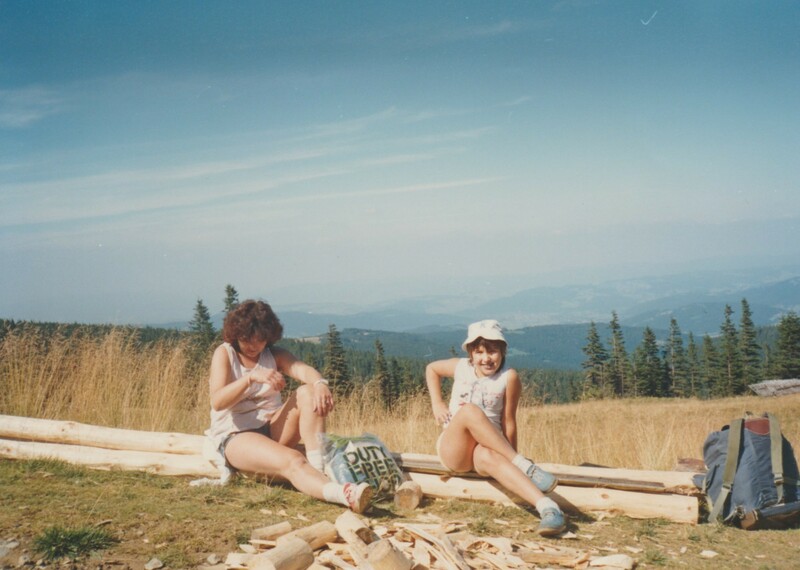 Year by year we climbed Pilsko of over 1500 m.a.s.l. that dominates the landscape of Żywiec Beskid and is its second highest peak. 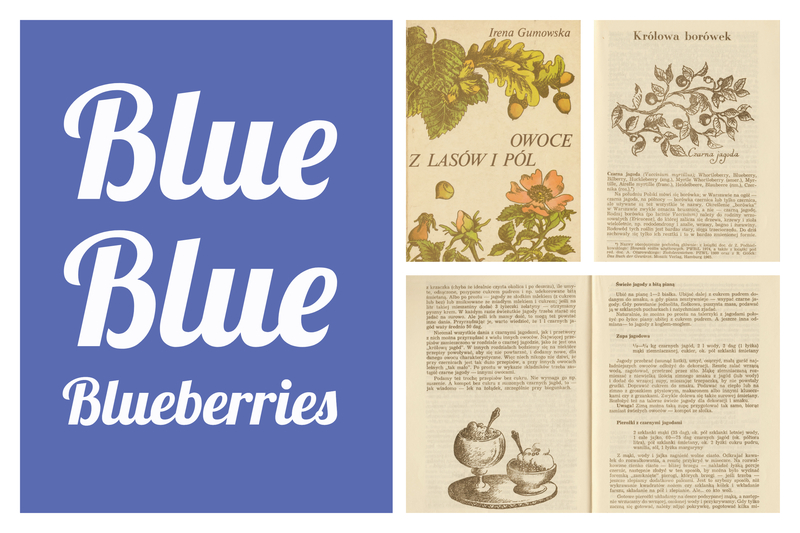 The place, that is one of the oldest and most beautiful Polish ski resorts in the winter, offers a few picturesque trails in the summer and plenty of blueberries on the way. The berries grow and ripe quite late at this height but are worth waiting for. We started the day quite early to arrive at the bottom of the mountain when the sun was still low. We packed a good assortment of empty containers that were clinking in the backpacks as we hiked. We climbed slowly as we were making our winding way through the wild blueberry bushes. We picked the little sweet berries and filled the containers one by one. I snacked on them until my mouth was blue. The time passed by quickly and soon enough all the jars, boxes and bottles were full of berries and we were just a short distance from the top. Now it was time to enjoy the sunshine and see the views. We got back home in the evening and neatly lined all the containers on the kitchen table. We had so many ideas what we could make and bake. Berries with sugar and cream. Pierogi – Polish dumplings with blueberries. Blueberry soup. Blueberry smoothies. Blueberry compote. Blueberry crumble cake. 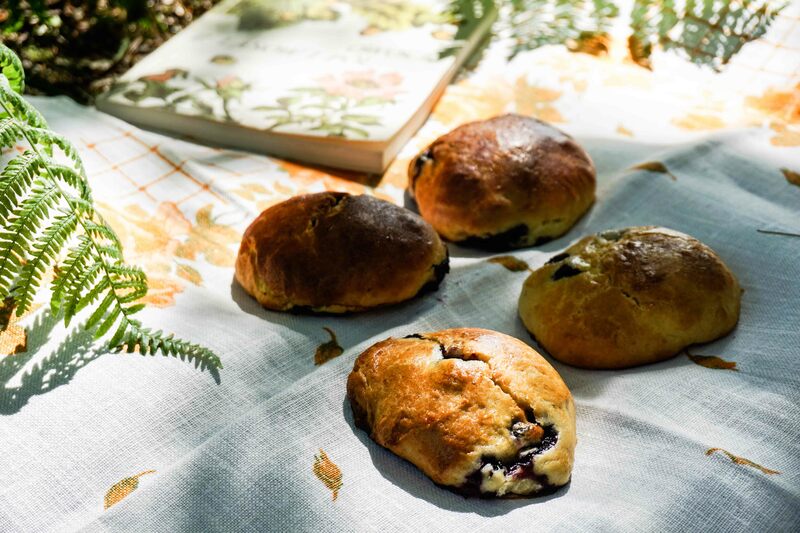 Blueberry buns. There were enough berries to suit all tastes and cravings. 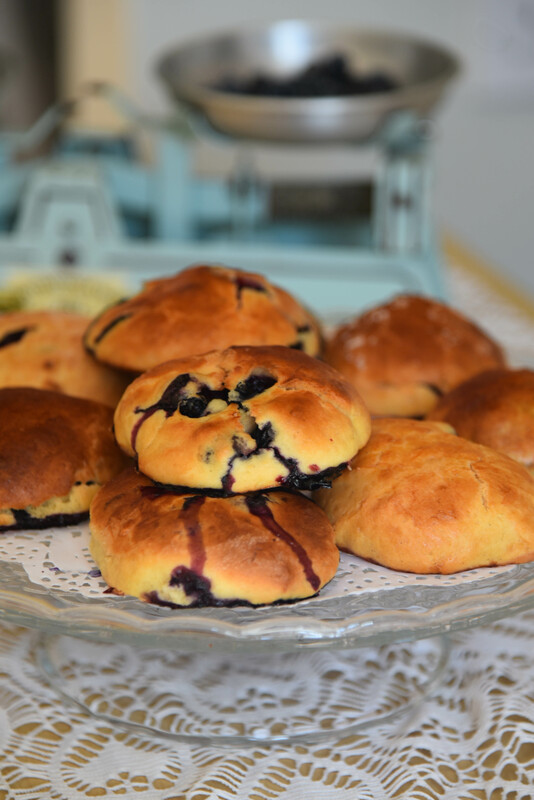 The Polish name for the blueberry buns – jagodzianki – sounds almost like little blueberry ladies. They are soft and tangy and make a great picnic snack. 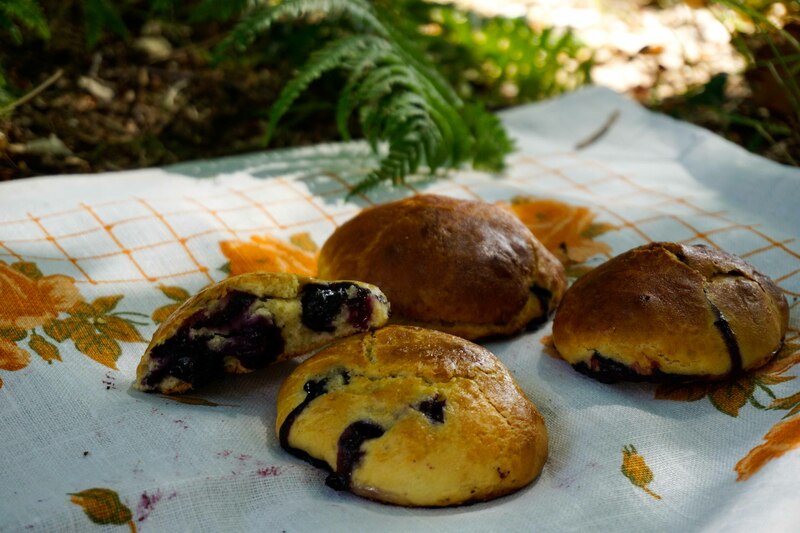 The real secret is to fill the buns with as many blueberries as you can, so that when you bite through the outer bun layer you get to a very gooey, very berry and very blue inside. In a small pot gently warm up the milk to the room temperature. Make sure not to overheat it. Cut the vanilla stick in half and add to the milk to infuse. Pour half of the milk into a large mixing bowl, add a tablespoon of sugar and crumble in the yeast. Stir and leave for a good few minutes to let them start working. Once the mixture becomes foamy and little bubbles pop up, add in the remaining milk, flour, salt, egg yolks, sugar and soft butter. 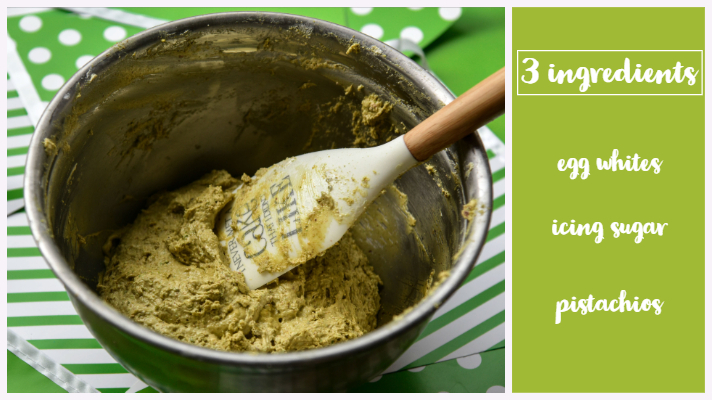 Mix well until thoroughly combined and the dough becomes smooth and silky, yet still a bit sticky. Cover with a cloth and leave to rise in a warm place for about an hour. It should double its size. In the meantime rinse and dry your blueberries. Place in a bowl and sprinkle with sugar. Preheat the oven to 190°C and line the baking tray with the baking parchment. Once the dough has risen, sprinkle some flour on the table top so that the dough does not stick. Tear a handful of the dough and form a little ball, then gently flatten it with your palm. Place as many blueberries as you can in the middle and fold in the edges. Turn around, pat in the flour and place the bun on the baking tray. Continue with the rest of dough until you have the tray full of buns (the recipe will make 2 trays of buns). Keep them in a warm place so that they continue to rise. Brush the buns with the egg white and put into the oven for 20 minutes. Enjoy at the picnic, at the seaside or just at home with your tea.